Update for 6.0: This strategy still works really well. 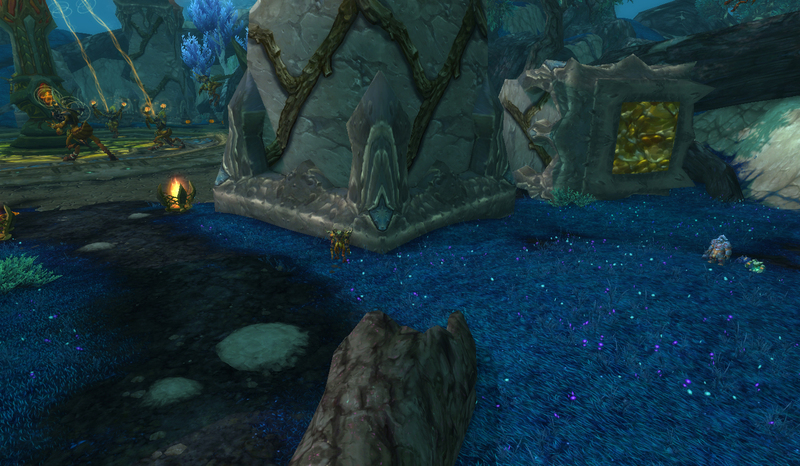 If you’re going on an Awfully Big Adventure with your Elekk Plushie, this strategy will work well for that too. 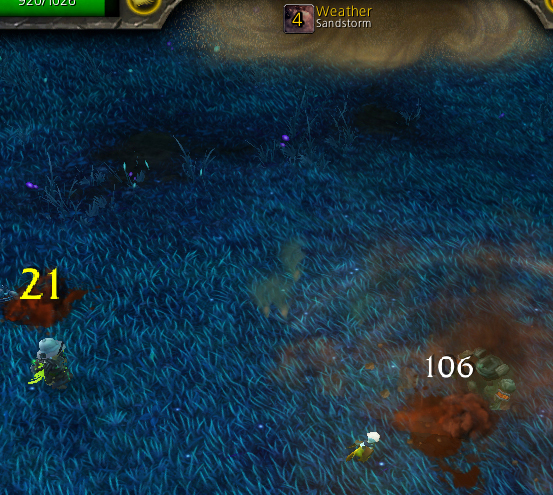 Just swap in your Elekk where you ordinarily would any other battle pet to be leveled. It’s a new year, and my resolution is to stop slacking and write guides for all the tamers in Pandaria, as well as the Beasts of Fable, the latter of which I haven’t even revisited since they were radically buffed in patch 5.3. Of course this means I’m going to get the guide for Wastewalker Shu finished and then give up after two weeks and eat a lot of ice cream, as that’s how my New Years’ resolutions typically roll. Wastewalker Shu is a little tricky. The moves you use to beat his pets are somewhat counterintuitive, based on the strategies we’ve used up to this point. 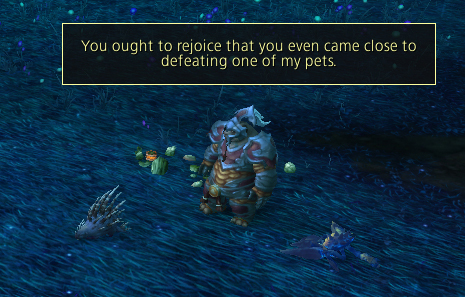 But then, what do you expect from a Pandaren who’d just set up shop in the middle of the Dread Wastes right next to Klaxxi-Vess, and then randomly decided to take up pet battling? A whole lot of logical decision making? 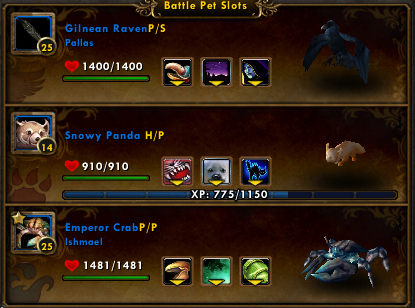 The Gilnean Raven can be subbed for many other Flying battle pets to great effect, and in this case can be subbed out for the Crow. It’s debatable whether the Raven or a pet with Lift-Off like the Dragonbone Hatchling is a better choice, but the Raven tends to make for a faster fight. The Crab is there, as usual, because Shell Shield helps a lot for this fight, and others with similar abilities will work here too, like the Anubisath Idol, Feline Familiar, etc. 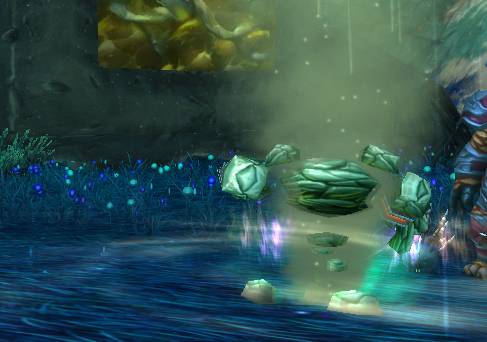 The carry pet is mid-teens because of some potentially nasty AOE. First up is Shu’s crab, Crusher. The reason I favor the Raven is because Crusher has a heal in his moveset. The reason the Dragonbone Hatchling is also an excellent choice is because Crusher also has whirlpool, which can be a pain for the Raven. It’s also worth noting that the Raven uses Peck in its moveset, and not the usual Alpha Strike. Crusher’s main attack move is Surge, so after his first couple rounds, your pet isn’t going first for the purposes of Alpha Strike’s additional hit. Second is Pounder, who is the oddball. He immediately leads with Sandstorm. A weather effect, oh no! *THIS* is why we brought that Raven really, right? To change the weather? We always change the weather! Nope, after a quick Rupture, poor Pallas usually goes up to birdie heaven. If Pallas dies before that Rupture, we’ll swap to the Crab as a soak, then switch to the carry pet for a turn before putting the Crab in til the end. Pounder’s main nuke, Quake, is an AOE that hits for roughly 300 in the front row, 150 in the back, for 3 rounds. Add Sandstorm’s shield effect and that Quake hits for diddly bupkis. 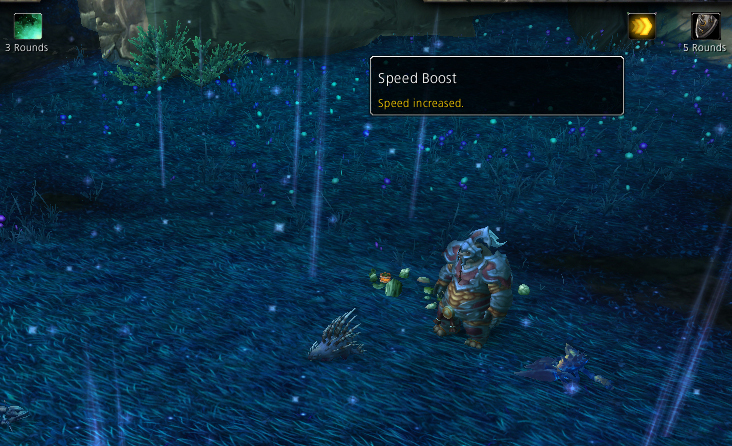 Sandstorm’s duration is only 5 turns now though, so if you opt to choose a pet with Sandstorm over a self-shield, you may be able to go even lower with your carry pet. The sandstorm shield is also one reason why I opted for Snap instead of Surge. You should finish Pounder with your pet at full (or nearly full) health, at which point Mutilator comes out. My crab is slower, especially after Mutilator starts in with Powerball, and I didn’t choose Surge for my crab so Mutilator’s Counterstrike won’t proc its extra damage. 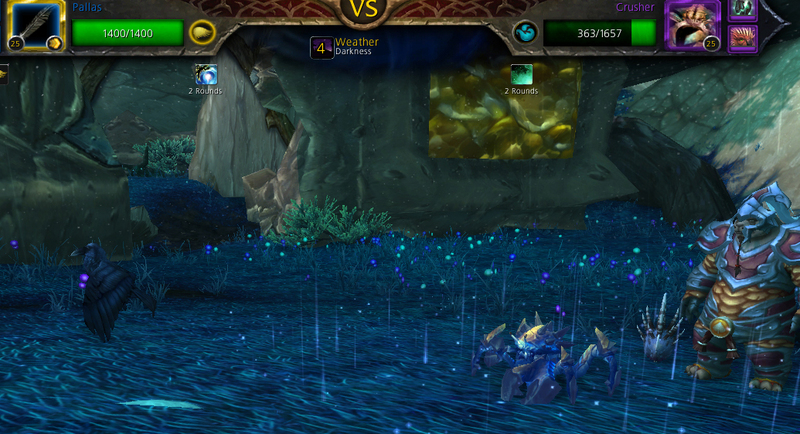 Because my crab has shell shield, I’ll absorb the reflexive damage from his Spiked Skin too. Just keep wailing away at him while you keep up your defensive abilities, and he’ll be toast in no time. If you’re having trouble the first time around, sub in a single-hitting beefy mechanical here (the clockwork gnome’s alternate moveset–NOT the one with turret–is a good pick) and you should be golden. I’d end with a witty one liner but I really need to get out of here. Jeez Louise I hate bugs. 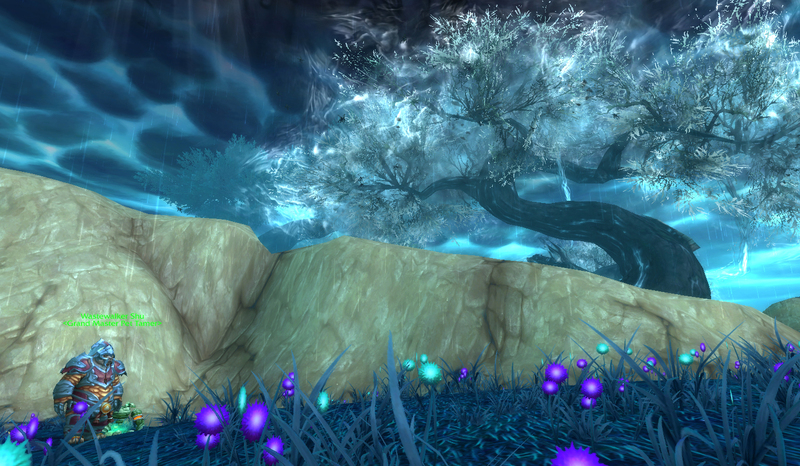 This entry was posted in Uncategorized and tagged daily, guide, pandaria, strategy on January 8, 2014 by Liopleurodon.